Who doesn’t love 4th of July?! The weather is hot, the pools are cold, and there is always so much to do and see. It’s a great time for families to get together, and a great way to celebrate our nation. To make sure this 4th of July is the best one ever, below are tips for keeping kids safe on 4th of July. Get in the shade – UV rays are strongest and most harmful during midday, so plan indoor activities during that time. Otherwise, be sure you kids seek shade under a tree, an umbrella, or some other form of sun protection. Cover up – Encourage kids to wear long-sleeved shirts and long pants or skirts can provide protection from UV rays. It doesn’t have to be heavy material, but anything to cover up their skin. Darker colors may offer more protection than lighter colors. Consider sun protection clothingfor your kids if they’re constantly outdoors. Wear a hat – Hats that shade the face, scalp, ears, and neck are easy to use and give great protection. Baseball caps are popular among kids, but they don’t protect their ears and neck, so it’s better to opt for headwear that provides a brim of sorts for all-around protection. If your child insists on a baseball hat, be sure to protect exposed areas with sunscreen. Wear sunglasses – They protect your child’s eyes from UV rays, which can lead to eye issues later in life. Look for sunglasses that block as close to 100% of both UVA and UVB rays as possible. Apply sunscreen – Use sunscreen with at leastSPF 15 and UVA and UVB protection every time your child goes outside. Apply sunscreen 30 minutes before they go outdoors. Don’t forget to slather their ears, noses, lips, and the tops of their feet. Reapply often, especially if they go in the water. It is always difficult to hear about children becoming injured around water. Inattentive parents are one of the main causes of child injuries around pools, yet you can see how easily it can happen. Parents and other adults are having a good time too; they’re socializing with friends and family, drinking, eating, playing games or even swimming too. Distractions are everywhere so it’s critical that every adult watches children around water, not just the parents. Consider water wings or other floating devices to add a layer of protection in the pool. They aren’t a substitute for diligent supervision by adults, but they most certainly add additional safety. To illustrate how important it is, consider this, according to KidsHealth.org, nearly 1,000 kids die each year by drowning. And most drowning happens in home swimming pools. It is the second leading cause of accidental death for people between the ages of 5 and 24. Let’s keep our kids safe by watching them around water! Being diligent with sun protection and water safety doesn’t mean you can’t have the most fabulous, fun-filled 4th ever. Use the above precautions to keep your kids safe, and know that this 4th of July you’ll be building memories that last a lifetime. 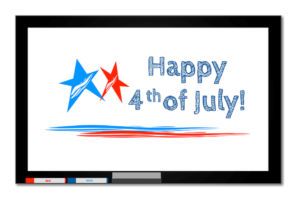 Have a happy and safe 4th of July! Don’t forget to brush!